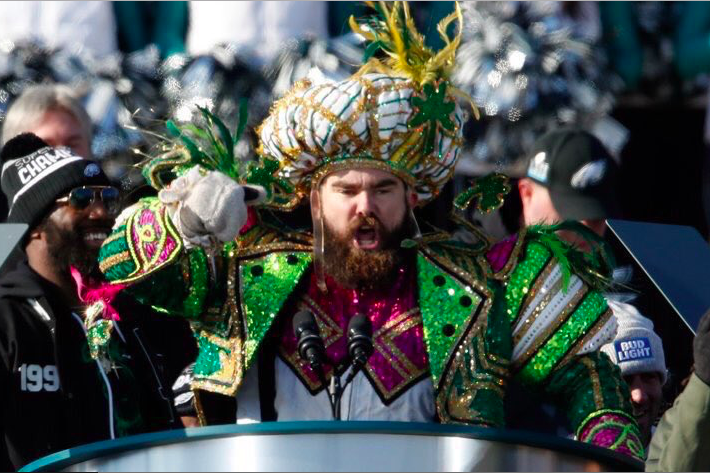 Philadelphia Eagles center Jason Kelce has donned many new titles over the last few months: Super Bowl champion, Mummers sax player, “Mayor” of Philadelphia … and now: husband. Though many of us have been distracted by the cutlery needs of Carson Wentz and his fiancée (revealed in their strikingly normal, now private wedding registry), it’s Kelce who managed to tie the knot first. Kelce married girlfriend Kylie McDevitt at the Logan Hotel on Saturday, April 14 – kudos to them for picking a day with perfect spring weather. A few photos of the couple’s nuptials are swirling on social media. Check out some of the shots below. His brother Travis was spotted at Geno’s Steaks after the reception. Now the real question: Did he lead a rendition of "Fly, Eagles Fly" during the celebration? Either way, congrats to the new couple.